Failed attempts on the War Memorial Gardens, Islandbridge. | Come Here To Me! « Upcoming meeting in The Cobblestone on radical politics of the late 1960s – 1970s. Failed attempts on the War Memorial Gardens, Islandbridge. While the destruction of British symbolism was a common occurrence here in the decades following independence, it was largely confined to statues and monuments of individuals that republicans objected to, like Horatio Nelson or King William of Orange. In the 1950s however there were two attempts made on the War Memorial Gardens at Islandbridge. Neither succeeded in doing any lasting long-term damage to the gardens, although the Cenotaph was damaged by the blasts. A blast on Christmas Day in 1956 was sufficiently loud to wake up people in Finglas and Castleknock, according to The Irish Times. 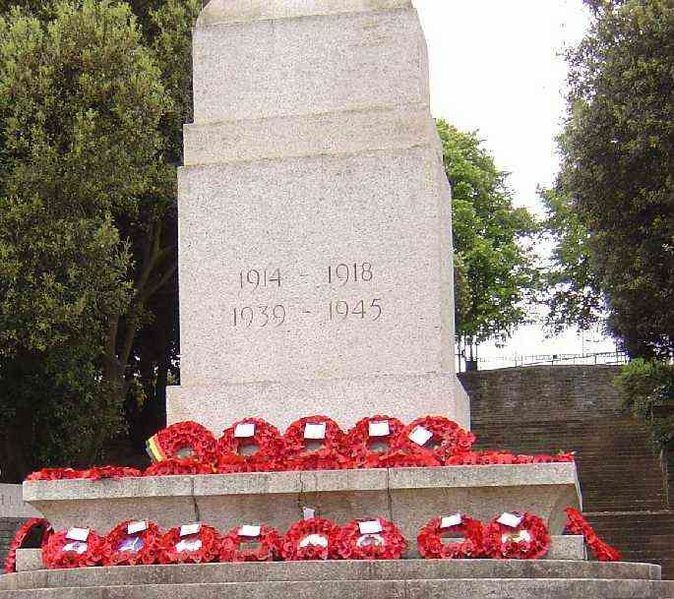 Poppy wreaths at the War Memorial Gardens, Islandbridge. The War Memorial Gardens at Islandbridge are the work of Edwin Lutyens, a celebrated London architect. While largely completed by 1939, there is a certain irony in the fact a memorial garden constructed to remember those who perished in the First World War had its opening delayed by the outbreak of the Second World War and the political instability it caused. 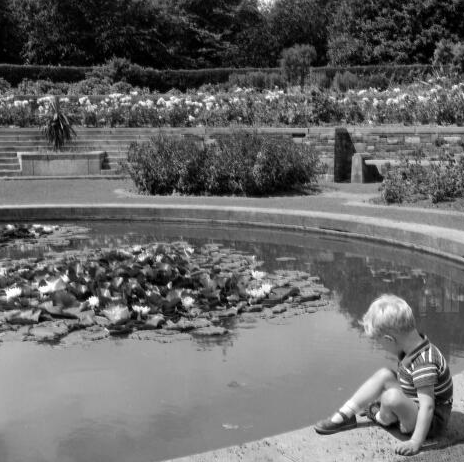 Incredibly, it was not until 1988 that the Gardens were formally dedicated and formally opened to the public, though it had long been a place of commemoration and remembrance by then. On 25 December 1956, a blast at 1am at the War Memorial Gardens occurred when a charge of high explosive was placed on the granite base of the large memorial cross. The blast may have awoken people in suburbs well beyond the memorial, but it failed to do any real lasting damage to the memorial itself. The British Legion condemned the attack as “a most disgraceful affair, particularly at Christmas.” The cross, made of granite from Wicklow, withstood the power of the explosion, with Gardaí believing the people responsible for the explosion “were not used to handling charges.” Despite not succeeding in doing any real damage, the bomb attempt did succeed in attracting considerable media attention, with the New York Times and other international outlets reporting on the Christmas Day attack. This wasn’t the first time republicans had attacked such symbols on Christmas Day, as on Christmas morning 1944 the statue of Lord Gough in the Phoenix Park was beheaded, though the head would later be found in the Liffey! While the explosion in Dublin had been a failure, the following year a British Legion memorial at Pery Square in Limerick would be shattered by the force of an explosion. On 8 August 1957 it was reported that “the 20ft high memorial, which was erected in 1932, was shattered, and houses in the vicinity suffered damage when windows were blown in.” Condemning the attack, The Irish Times asked “what kind of mentality can justify to itself these childish conspiracies to remove from our midst symbols of what is, after all, our own history?” The attack was unclaimed by any republican group at the time. Despite the attack on Christmas Day 1956, the gardens remained a focal point for Remembrance Sunday events in Dublin, and in November 1957 huge numbers of British Army veterans paraded in the memorial gardens, while it was noted former soldiers also paraded “via Parnell St. and O’Connell St. to Bachelor’s Walk.” There were no reports of clashes, something which had been rather common during such parades in the 1920s and 1930s. The laying of wreaths at Islandbridge became an annual event. 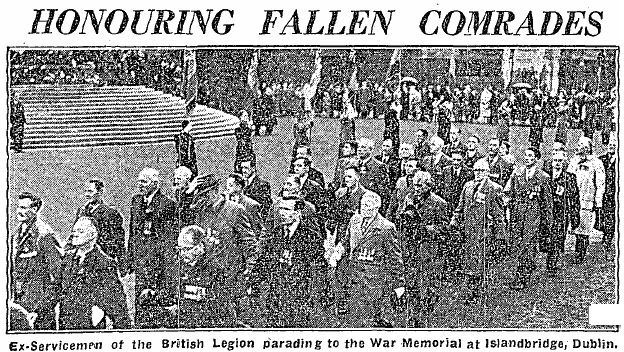 Independent photo showing parading veterans in the Memorial Gardens, November 1957. A follow-up attempt on the Dublin gardens took place in October 1958, and it was reported that “the flash of the explosion was seen in Rialto, almost two miles away.” Once more, the huge cross withstood a republican bomb with only minor damage to show. The Irish Republican Publicity Bureau denied any involvement in the attack. Five men were later arrested and questioned about the explosion, though it remained an unsolved incident. In 1961, the issue of attacks on the War Memorial Gardens and other memorials and monuments was raised in the Dáil. 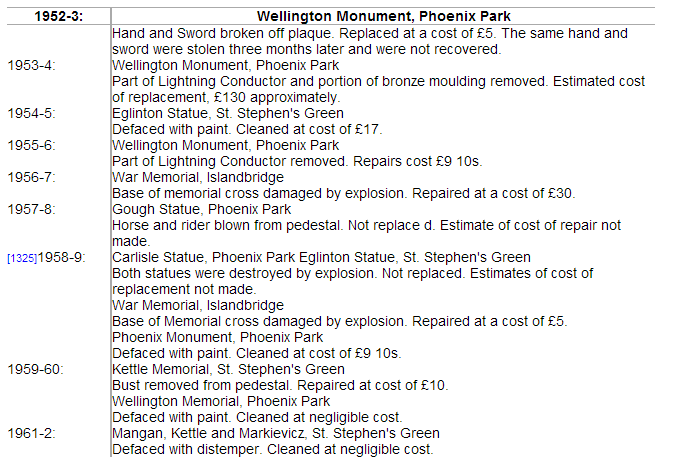 Asked to give an idea of the extent of damage to monuments in recent years, Minister Joseph Brennan gave the following details. It looks like the Duke of Wellington got a particularly hard time! The Islandbridge memorial is not the only WWI memorial in Dublin, and readers may be interested in a previous CHTM article looking at the Trinity College Dublin war memorial. I have a page up on the Gardens in honour of my uncle, John P Dwyer, who died on the Somme in 1916 and whose anniversary is coming up at the weekend. The interesting thing about the attempted destruction of British memorials post-war is that the IRA usually weren’t involved. (The 1944 Gough attack was carried out by Ailtirí na hAiséirghe). From 1948 the IRA were under orders not to carry out such operations (or any offensive actions)n in the South and this was formalised under Army Order No. 8. It was the various splinter groups (such as the one led by Joe Christle) who carried out the attacks mentioned above and of course the destruction of Nelson’s Pillar as well. The condemnations from the Irish Republican Publicity Bureau were sometimes pretty blunt alright. I think the forgotten explosion was the statue of the Earl of Eglinton and Winton in Stephens Green, odd as it was one case where people were very nearly killed.